Cooler Master has launched a new full-sized mechanical gaming keyboard which includes Aimpad technology. It claims this is the world's first mechanical keyboard packing Cherry MX keys that includes the analogue pressure-sensitive tech for "unparalleled control in even the most demanding PC games". Starting with a focus on the special features here, Aimpad blends Cherry MX mechanical technology with IR sensors to a cluster of eight keys on the MK850, the QWER and ASDF keys. The IR sensors can "sense the entire 4mm range of a key press versus competitor analogue keyboards that are only capable of measuring 2mm of analogue movement and do not utilize Cherry MX switches," asserts Cooler Master. If you aren't familiar with the purported benefits of analogue keys in gaming, this keyboard will allow you to control speed, yaw, adjust pitch, creep, and roll, for example, with smooth increments. In contrast, a traditional mechanical keyswitch sends just a simple on-state to the PC after it reaches a certain threshold - its actuation - so you get 0 or 100 per cent. Previously we have seen Cooler Master launch a separate numpad-style peripheral offering Aimpad technology to users, via Kickstarter. HEXUS wrote about the Cooler Master ControlPad last October. The twin knurled control wheels are another attraction where some keyboards have none or only one. They can be configured to adjust volume, dial in your DPI, change colours, and more. Accompanying the wheels are five dedicated multimedia keys. Elsewhere in the Cooler Master MK850 design there are plenty of attractions to put it on a par with flagship gaming keyboards from other makes. 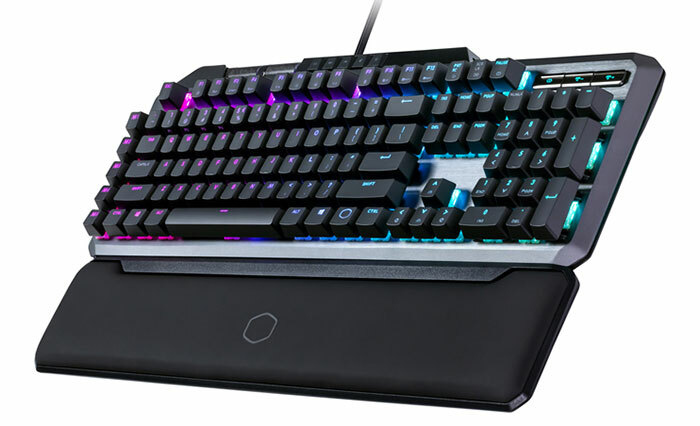 For example it has per-key RGB backlighting, built-in ARM Cortex M3 controller with 512KB memory backup, a removable Type-C cable, anodized aluminium top plate, magnetic wrist rest, and fast 1ms response rate. You can fully program the MK850 with the software suite available here. What I have liked about Cooler Master keyboards I have owned previously is that you don't usually need to run this software at startup on your PC, thanks to the persistent onboard memory. In its email to HEXUS, Cooler Master said that the MasterKeys MK850 will be available in the UK from March priced at £209.99 inc. VAT. It is pre-orderable from Scan at this price. Yes, 180 degree, 3 ways.